March 12, 2019 The cease and desist claim against Red Dead Redemption 2 has been dropped. Red Dead Redemption 2 publisher Take-Two Interactive has confirmed that the claims made against the game by Pinkerton Consulting & Investigation company have been withdrawn. In a statement to gamesindustry.biz, Take-Two said that as a result of the withdrawal, it has dropped its counter-case against the company. 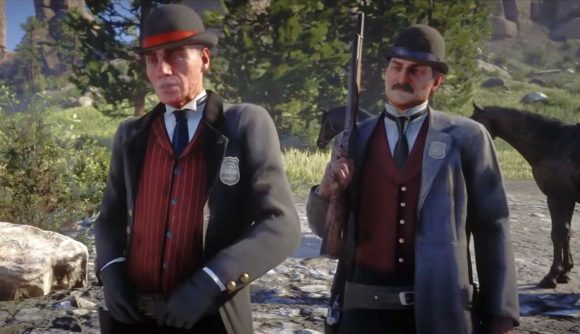 Pinkerton’s initial claim was made in December 2018, when the company made a claim for royalties from Take-Two and Red Dead Redemption 2’s developer, Rockstar Interactive. The complaint was based around the game’s use of the Pinkerton Detective Agency as a narrative device within the game. Pinkerton agents feature in the game as antagonists due to their investigation of the Van der Linde gang, something that the agency also objected to. In response, Take-Two issued a counter lawsuit against the Agency, saying that they “cannot use trademark law to own the past.” Now that Pinkerton has withdrawn its demand for royalties, that counter-suit has now been withdrawn. The Pinkerton National Detective Agency – now simply known as Pinkerton – is, as you might guess, a private detective agency. It was founded in Chicago in 1850, and as Take-Two says, “played a key role in the history of American law enforcement and the taming of the Wild West”. Pinkerton agents were employed by the US Government to enforce federal law and hunt down fugitives, such as Jesse James, and Butch Cassidy and the Sundance Kid. Take-Two also takes the chance to brag about Red Dead Redemption 2’s sales success and critical acclaim, though I suppose that’s not irrelevant to its case. The suit also describes Red Dead 2 as “essentially an interactive film” – a way to explain it to non-gamer judges and lawyers, or interesting admission of the way Rockstar sees its work?